Photo courtesy of Angus Fursdon-Welsh. Beware of safety. Run into obstacle to avoid safety! 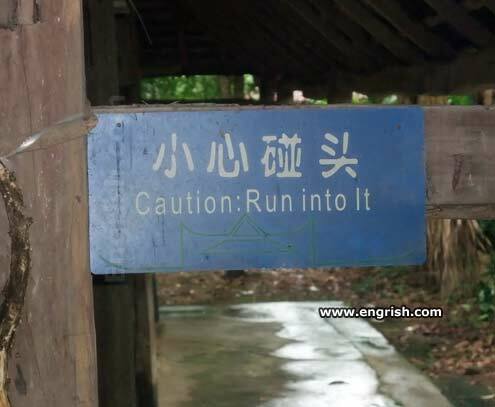 Thanks, but I think I’ll recklessly avoid it. Other signs in the ruthless practical joke series include “cliffs ahead: throw yourself off”, “increase speed – dangerous curves”, and the ever popular “Please provoke the bears”. Other side of the sign: Stupid! If your shattered ribcage matches one of these four diagrams, you win a Big Mac! Offer must be redeemed the same day. Not valid in Uruguay. Fries not included. Notice the capital “It.” You could meet Pennywise here! I’m sorry your IT application closed unexpectedly. Throw nearsty geek into lamppost and reboot drive. Park Ranger: I’m calling in a 414: Visitor has avoided the sign. Please send backup. This message brought to you by the society for the advancement of natural selection. does the blue mean its safe to do so? Just don’t insanely walk into It. I didn’t know they have a platform 9 3/4 in China! Road Runner: Run into It. Wile E. Coyote: Bang your head. Run into it before living. Run into that wall before it runs into you!! face your fears…c’mon DO it!! Wow, right to the point this time. It makes so much more sense! Anybody up for a game of find the stud??? One… twoo… hold it… THREE! NOW RUN INTO THE CAR!